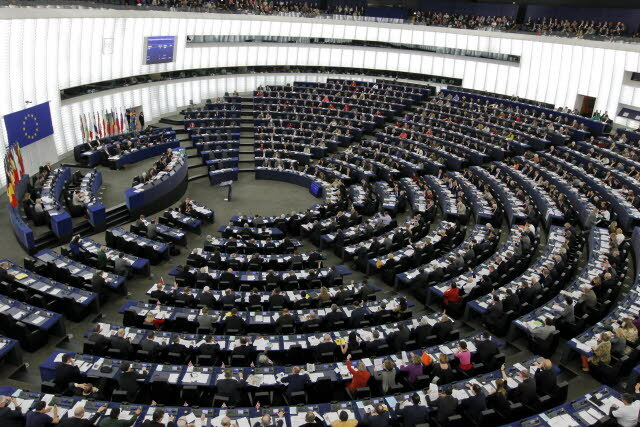 The debate in the European Parliament on Wednesday (September 12 ) about Romania's political situation was heated, not just because of speeches given by Romanian European Parliament Members, but also because of other countries' MEPs, who commented on Romania's internal political quarrel. Austrian Hannes Swoboda, the head of the Group of the Progressive Alliance of Socialists and Democrats in the European Parliament, British Liberal Democrat Graham Watson and German Manfred Weber, from the European People's Party Group (Christian Democrats) held speeches, which were then commented on by Romanian MEPs. The latter said he was disappointed by the political events in Romania in the last two months, as these did not happen in some banana republic, but in an EU member country. Even though initially only 5 of the 33 Romanian MEPs had registered to speak in front of the Parliament, around half ended up talking and replying to fellow MEPs. The debate, which should have lasted only 40 minutes, ended after an hour and a half. Socialist Swoboda however said the term coup d'etat was unfair for describing the situation in Romania. Graham Watson's speech highlighted the best, in his view, solution for Romania, holding a general and a presidential election at the same time. He also underlined that no party is 'clean,' not even the European Union, highlighting that Romania was required to reach a quorum in the referendum, even though this rule never applies in any other EU country. Romanian MEP Renate Weber, from Romania's National Liberal Party said EU Commissioner Viviane Reding is responsible for the blown out of proportion reaction and accused her of false accusations during her assessment of Romania's political situation. Reding was also berated by Romanian MEP Catalin Ivan, leader of the delegation of the Social Democratic Party (PSD) in the European Parliament (EP), who said her recent statements have caused Romania a great many problems, including economic damage. Fraud allegations were brought into the discussion by MEP Monica Macovei from the Democratic Liberal Party (PDL), who said the July 29 referendum vote was rigged, but also by MEP Corneliu Vadim Tudor, who reminded of the 2000 elections, when he came second in the second round of the presidential elections. “All elections in Romania are rigged, believe me. […] This stealing machine is controlled by the CIA and Romania is an American colony,” said the MEP, who is known for his striking declarations, at home and on the international scene.